It’s snowing as I type this. There should be nothing unusual about that statement – it’s late at night in early January and I live in the Catskills mountains in the north-eastern United States, four miles equidistant from two different popular ski resorts. Our home is at an elevation of 1500 ft. By this time of year, we’ve normally received several feet of snow. So here’s the rub: as the snow falls outside my window, we’re still waiting to measure our first full inch of the winter. How do you measure global warming? By hot summers? Or by mild winters? New York City, in line with the planet as a whole, experienced its sixth warmest year on record in 2006. But this was not the result of a severe summer – the highs of July and August were well below the average for that time of year. It was the spring and winter months that seemed totally out of line, with two January days and one in March experiencing record high temperatures, February enduring a record daily rainfall and a record snowfall (the two feet of snow in the city that, weirdly, failed to deliver more than a few inches here in the mountains), and the highs and lows from one day to the next resembling more the reading of a fetal monitor during labor than a regular weather pattern. New York City’s daily weather for 2006 (as printed in the NY Times of Jan 7), shows an unhealthy range of highs and lows for January through March. How do you measure climate change? Almost a year ago I heard a radio report that took the number of days when the temperature rises or falls more than ten degrees farenheit as a mark of something wrong. There were something like ten of those last January alone. The birds and the trees didn’t know whether they were coming or going. Hell, winter didn’t know if it was coming or going. Snow would fall here in the mountains – as one would expect – and the next day the temperature would climb into the 50s, rain would fall instead and it would all be washed away. It was, by all accounts, a very strange winter. But at least we had snow. 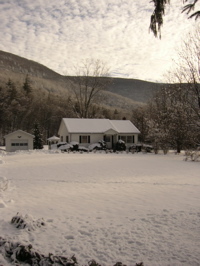 And indeed, just four years ago, our first winter as Catskills weekenders, we lived under a solid blanket of the stuff from Thanksgiving, when we got the place, until April, five months later. Two and a half feet dropped on Christmas Day. Another two feet on President’s Day. From January into February, we went an entire month without the mercury rising above freezing. It was, said all the locals, a particularly brutal winter. So does that make this year merely a particularly mild one – i.e., nothing to get unduly excited by, nothing to write home (or online) about? I would love to believe so. 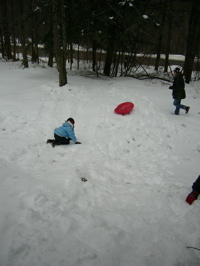 I am aware, however, that each of our subsequent winters in the Catskills has been milder than that of ’02-’03, each with less snow. Likewise, I am also fully aware that this is not a regional anomaly: the warm weather on America’s east coast this winter is being mirrored in Europe, where the ski companies are equally miserable, and where world cup tournaments have been canceled, right in the peak of winter, for lack of the white stuff. The Times addressed this issue on Sunday in its Week In Review section. Europe, it points out, is a contigious continent that largely experiences weather patterns in unison, leading to discussion between Governments and their peoples on such patterns’ causes and effects. The United States, on the other hand, with vast oceans on either coast and the Rockies inbetween, “is almost always experiencing more than one so-called weather anomaly at a time,” True enough, even under ‘normal’ circumstances, this is a land mass of earthquakes, hurricanes, tornados, heatwaves, floods and blizzards, and it’s easy to assume that the latest weather anomaly is merely a headline-grabber, not a harbinger of our planet’s demise. How then, do we measure global warming? Not by living in Washington, DC, as do America’s politicians. “The East Coast of the United States, and particularly the mid-Atlantic region, did not warm nearly as much as the rest of the globe over the 20th Century,” observes a Dr. Michael Mann, a climatologist from Pennsylvania State University. So while Europe’s heatwave of 2003 was a wake-up call that resounded throughout the continent’s parliaments, here on the East Coast it’s remembered as a particularly wet summer, not the kind to set alarm bells ringing in the White House. The subsequent summers in Europe have continued to be scorchers, to the extent that my British friends seem content to holiday on the English south coast now rather than the Costa Del Sol – but they haven’t been that eventful on the American east coast. It’s easy to ignore the warning signs when you can’t see them. Those warning signs are now flying in our face. This past Saturday, January 6th, temperatures reached 71 degrees in New York City and Albany alike. At Bradley International Airport in Connecticut, the thermometer reached 72: the previous high for the day was 58. That’s not a blip on the radar, it’s a blowout. (The previous high for any January day there was 70 degrees; we’re talking the highest January temperatures ever recorded.) Our family spent Saturday evening, after a day that should have been (but was not) spent skiing, at a friend’s art opening in Windham, where Noel decided to run up and down the sidewalk without a jacket; usually at this time of year, a 2-year old would scream at even the thought of being outside. 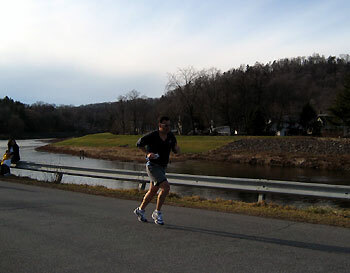 And Sunday morning, I competed in the Viking Run down in Rosendale – surprising myself by dressing in shorts and t-shirts for a warm early January run under a blue spring-like sky . 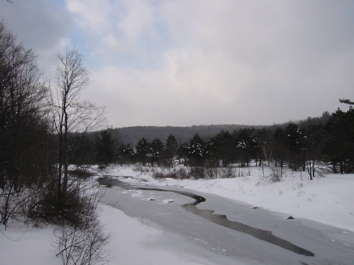 Rosendale at the foot of the Catskills, January 6, 2007. Reading the reports of Saturday’s record-setting temperatures alongside the statistics from 2006 suggest that climate change can indeed be read in other ways than heatwaves. 2006 was, as already noted, the sixth warmest New York City year on record. But it was also the sixth wettest. Taken in isolation, neither statistic is entirely earth-shattering; taken together, they are certainly disturbing. Barely two days since these record high temperatures were set in this area, it’s finally snowing here in the Catskills: that means a temperature drop of over 40 degrees Farenheit in almost as many hours. Except now I look out the window again I see that the snow has stopped already, barely an hour after starting…. Editing this piece Tuesday morning, I note that the Hunter Mountain web site reports the overnight fall as barely a quarter of an inch. We are still waiting to rack up one full inch of snow this winter – at a ski resort, as we enter mid-January. So, how do we measure global warming? Yes, New York City experienced its sixth warmest year in 2006. And yes, it also experienced its sixth wettest – despite March being the driest on record. But of all the statistics available, here’s the one that makes the most frightening reading on the east coast. New York City just experienced its first snow-free December since 1877. That’s its first snow-free year in 129 years.